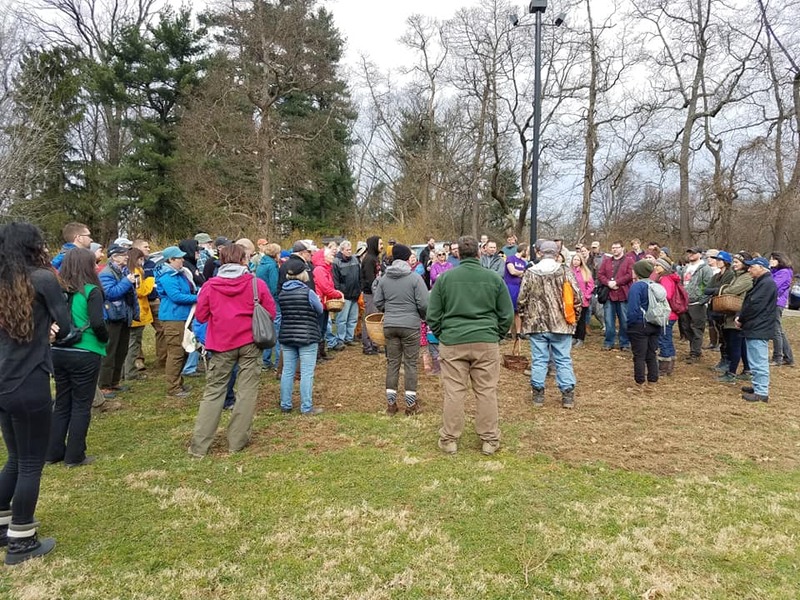 Over 80 people attended the first spring walk with the WPMC at Hartwood Acres in Allegheny County. Despite rain in the forecast, conditions were mostly dry and temperatures were mild. Forty species of fungi — mostly comprised of polypores, crust fungi, and a few jelly mushrooms — were collected and displayed at the end of the walk. Species identified by Garrett Taylor, John Plischke III, John Stuart, Jim Tunney, La Monte Yarroll, Adam Haritan, and others. Photograph by Kim Plischke. Species list entered by Adam Haritan. Photos by Kris Murawski and Kim Plischke. I haven’t been able to figure out the Mycena, but I have the micro on iNat, I’ll look again but I don’t think it’s on mycoquebec, or if so it’s not like the picture. A couple small ones that didn’t make it to the table from my case, Lycogala epidendrum, and Sarea resinae. Wonderful turnout. Glad to see so many anxious to explore and cute pup. I caught a rude reminder during the foray that it’s always tick season. Be careful out there, fellow foragers!